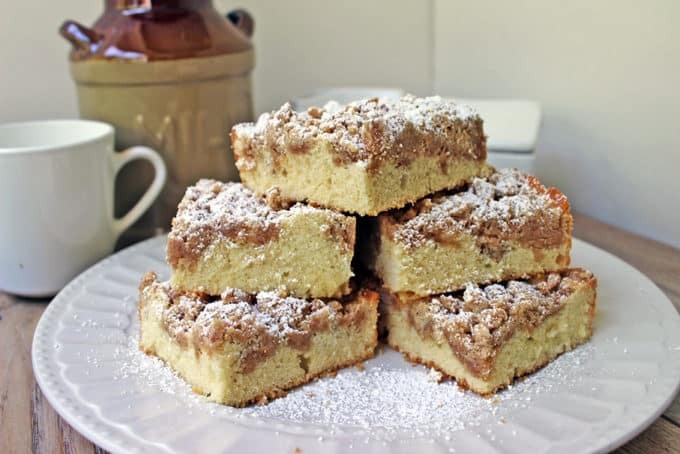 Classic New York Crumb Cake just like the kind you would find in your favorite coffee shop, a tender cake topped with large chunks of cinnamon sugar goodness! 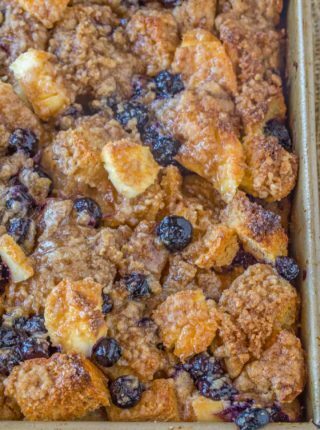 Like my Easy French Toast Bake and Blueberry Cream Cheese Coffee Cake, this recipe is a perfect breakfast option for a crowd! 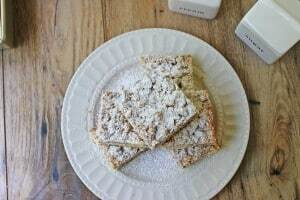 New York Crumb Cake is a copycat recipe of the old NY Crumb Cake Starbucks used to sell years ago. 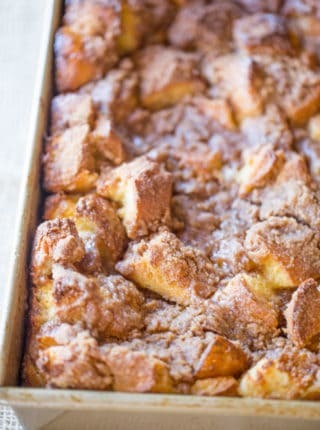 I don’t mean the current Classic Coffee Cake that they’ve transitioned to. I mean the old school giant squares of cake with the most amazing large crumb topping pieces. As employees we would snack frequently and this was definitely the favorite baked good for the whole staff. Any that was left by the date we needed to rotate in new pieces was generally argued over. This is THE crumb cake you will want to make for any and all brunches or treats you bring into the office. I made the tray just for myself and froze the remaining 8 pieces so I could enjoy them with my morning coffee. If wrapped invidually well with saran wrap then placed into a ziploc bag with the air pushed out, this cake is delicious even if defrosted. 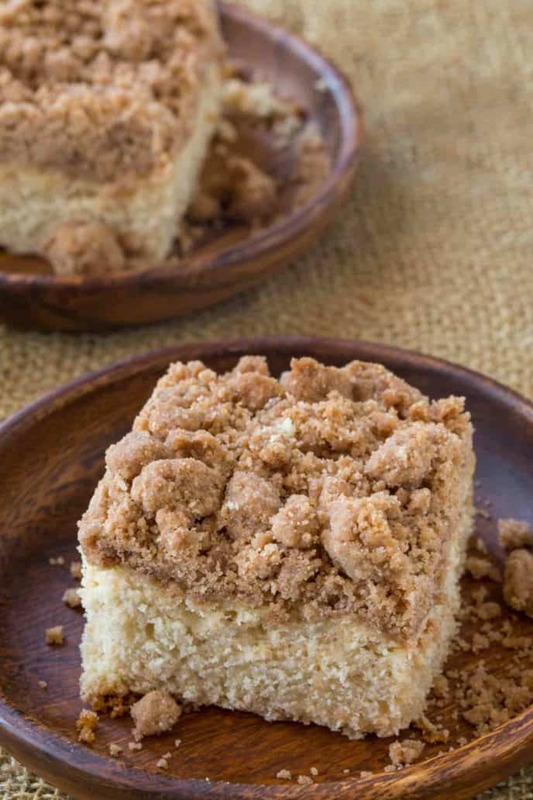 This isn’t exactly an old fashioned crumb cake recipe, but it is a delicious option you’ll love in place of the standard coffee cake. Use very cold butter, this will preserve the large chunks. As a taller single layer cake, cook on lower temperature. If you find the top is browning too much tent it with some foil. Keep cake covered to avoid drying out. Look at the ball of topping in the below photo, this is the consistency you’re looking for in the ball and the broken apart pieces. Keep the topping cold until baking or it can melt. Keep the chunks larger and sprinkle gently over the top of the cake. 9×13 pan: This allows for the signature square pieces, you can also make this in a Springform Pan. Stand Mixer: A workhorse, I’d avoid a hand mixer here for the crumble if you can. 9×13 baking pan with Cover: Keeping this cake moist is important and this covered baking pan is great. Delicious, classic NY Crumb Coffee Cake just like the kind you would find in your favorite coffee shop, a tender cake topped with large chunks of cinnamon sugar goodness! Add sugar, dark brown sugar, cinnamon, salt and butter into a bowl. Whisk together and add in cake flour until combined. Form into a dough ball. Let sit until you are done making the cake. Use baking spray or butter and flour a square 8x8 pan. On low speed, add butter in pieces. Mix for 1-2 minutes, or until you no longer see the butter and the mixture looks like a crumble. Mix until light and fluffy, another 1-2 minutes. Pour and spread cake batter into greased baking pan. 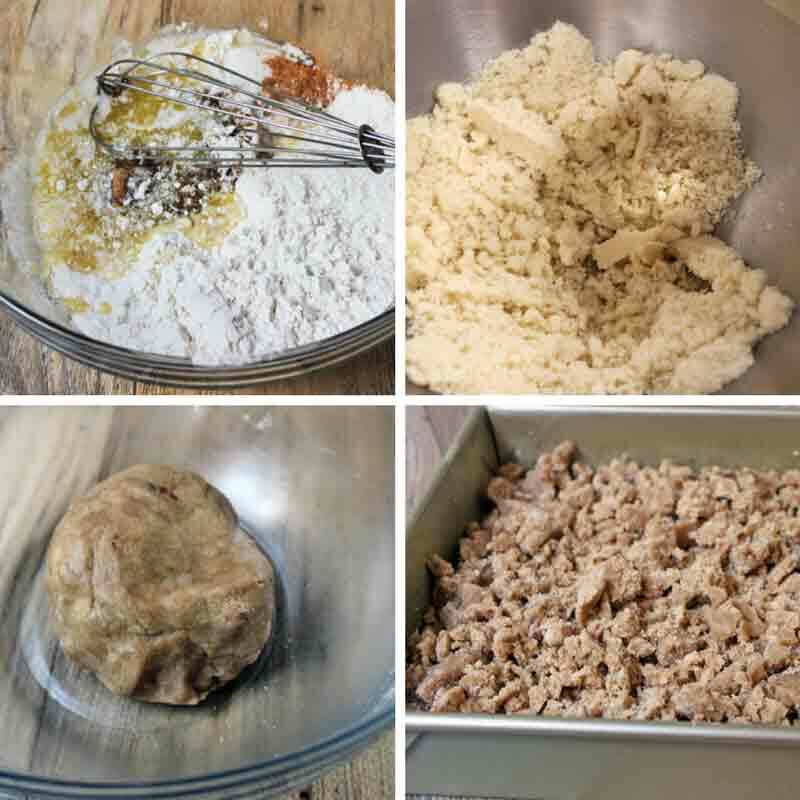 Take the topping dough and break apart into chunks about the size of marbles over the dough in a uniform pattern. Bake for 35 to 40 minutes, or until a knife is inserted and comes out clean. You seriously used a 9×13 pan with this recipe? Seems like you’d be baking a cookie instead of a cake? Yes, I used a 9×13 pan for this. Lol, I see you’ve given up. I’m going to double the recipe, make in 9x 13 and see how it turns out. I will make the topping first and put in freezer while I make the cake batter, then top with the very cold crumbs. I’m sure it will take longer to bake so hopefully that will offset any overbrowning of topping. It will be an experiment, so we’ll see if it pays off. THERe seens be a be discrepancy on one. oF the tools needed. 9×13 or 8×8 baking pan. So sorry about that. This recipe calls for an 8×8 pan. you might want to take the 9×13 off this recipe completely. doing that size at the temp/time indicated literally burns everything. since this is one of the top search results for this type of recipe, it’d be much better if it was less confusing about the pan size. What I meant to say is that the CRUMB part was good. However the cake part came out rigid. Not cake like. Are u using actual all purpose flour to make the cake. Or an actual cake in the box type of flour. You should use cake flour NOT all purpose flour to make this cake. You’ll find it in your baking aisle but it is different from all purpose flour. Found this recipe today. Trying it now for breakfast in the morning. Carefully measured out the ingredients. Using Swans Down cake flour (1st time). 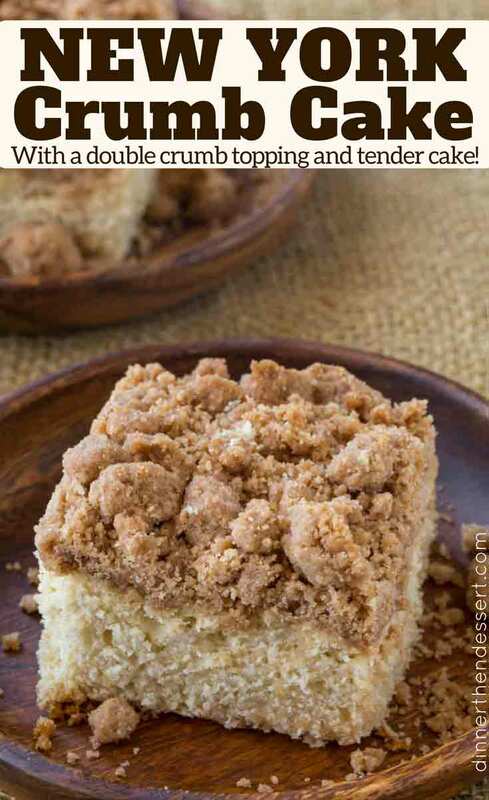 The crumb topping is sinking into the cake. Hopefully it will turn out ok. In your comments your talk about a 9×13 pan, but in the directions a 8×8 pan is listed. Which one is correct? 8×8 is the size you’ll want to use for this recipe. Sorry for the confusion! In the very beginning of the recipe it states to make it in a 9×13″ pan. As i scrolled through the entire recipe, it states to bake it in a 8×8″ pan. So which pan should i use? 8×8 is what you’ll want to use for this recipe. Sorry for the confusion. confused here. you indicated to use a 9×13 pan but in the actual recipe you refer to a smaller size pan……Can you please clairify. Thank you! You’ll want to use an 8×8 pan. I wasn’t able to find a link to the same one I used so I just put the 9×13 as an example. Sorry for the confusion! The butter for topping wasn’t Nearly enough. I had to use nearly two sticks and still didn’t get the consistency shown. I’m thinking the issue would come from not measuring the flour correctly, like maybe there was too much flour added. Next time, ensure you’re using a spoon to fluff the flour out into the measuring cup and not scooping it out. Hopefully this helps! Very disappointed in this cake. My crumbs all sank. What did I do wrong? So sorry it did that. 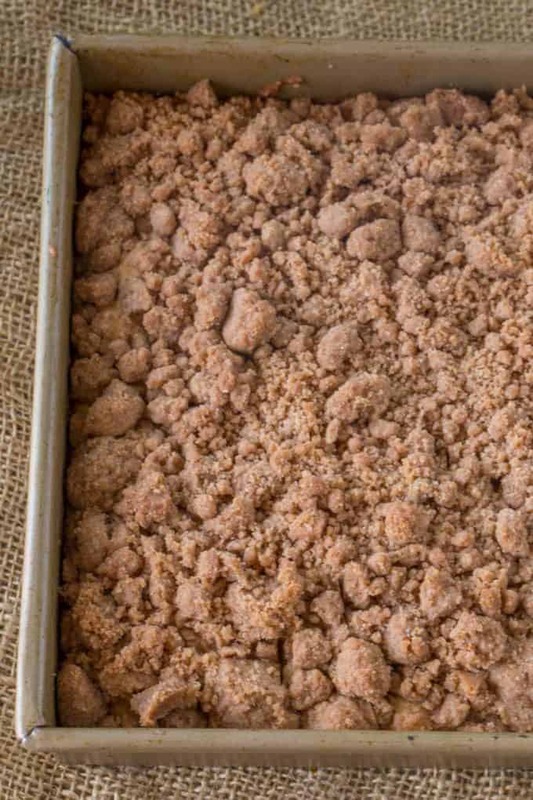 I would recommend making your crumb topping in smaller pieces and put it immediately into the oven. Don’t let it sit. Hopefully this helps if you decide to try again. I’m wondering about the 1 3/4 cup flour in the crumb topping. Is that a lot of flour? I’ve made other crumb toppings that had similar ingredients but only 1 1/4 cups flour. Sabrina, did you use an 8×8 or a 9 x 13 pan to make this cake? 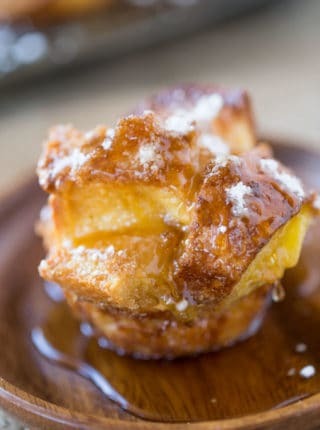 This recipe is exceptional! 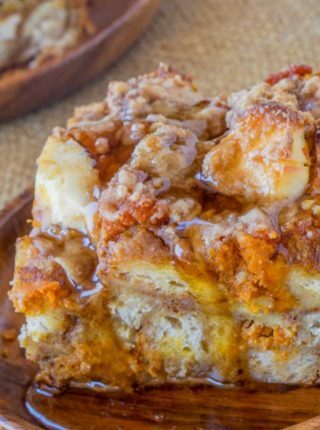 I love the Starbucks coffee cake and I think yours is even better. I have made the copy cat recipe and tweaked it, but it can’t hold a candle to yours. I also appreciate that you give us a velvety, moist cake made from scratch under all the yummy topping. Thank you for sharing it with every one! You’re very welcome, Caroline! I’m so glad you made it and then came back to tell me about it! 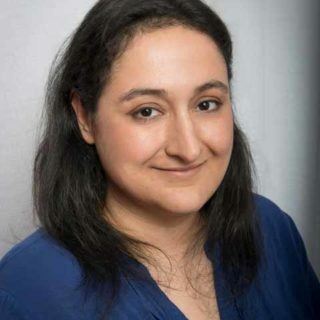 I look forward to seeing you around the site! Will definitely make this. And I know exactly where you worked- right across from my law school. Thanks for helping me get through. Someone very close to me went to that law school too! 😉 I hope you enjoy the recipe! That was a seriously fun job! I still tell anecdotes from those days! Totally gonna make this cake and stroll down memory lane! ?? Seriously. Remember the banana yellow suit?! 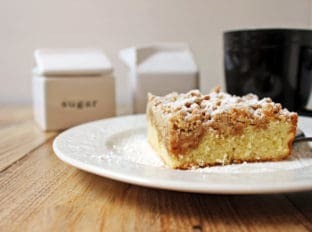 There’s nothing like coffee and crumb cake for breakfast! I must have this! I had the last piece this morning. I was sad reading the post after it was all gone. I wanted another piece! I like the cake even without the coffee. I would eat this all day! There’s nothing like crumb cake with coffee to start off the day! I have to have this! What a gorgeous cake! This is just the sort of thing I love to indulge in as a treat with coffee. Your step by step is perfect to ensure a great cake. Aww thanks! Sometimes I feel like I overdo it with pictures, but I am glad you like them! 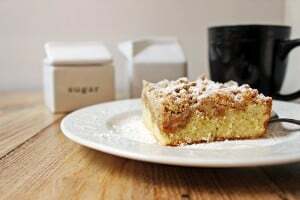 Oh, I love coffee cake with crumb topping. Can’t wait to make this. This looks so scrumptious and tasty! This would be a great cake to bring for my monthly ladies group at church. I enjoy things that pair well with a cup of coffee, too. Yes! 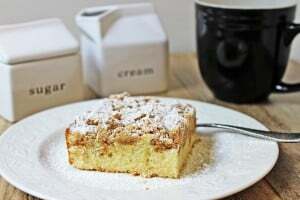 This cake is wonderful with a cup of coffee! I hope your ladies group loves it!